Artist conception of hot gas being siphoned from a companion star and riding upon a wave of spacetime around a black hole. A spinning black hole in the constellation Scorpius has created a stable dent in the fabric of spacetime, scientists say. The dent is the sort of thing predicted by Albert Einstein's theory of general relativity. It affects the movement of matter falling into the black hole. The spacetime-dent is invisible, but scientists deduced its existence after detecting two X-ray frequencies from the black hole that were identical to emissions noted nine years ago. The finding will allow scientists to calculate the black hole's spin, a crucial measurement necessary for describing the object's behavior. Black holes form when very massive stars runs out of fuel. Their cores implode into a point of infinite density and their outer layers are blown away in a powerful supernova explosion. Within a theoretical boundary called the event horizon, the black hole's gravity is so strong that nothing, including light, can escape. The X-ray frequencies detected by the team of researchers came from outside the event horizon of GRO J1655-40, a black hole located roughly 10,000 light-years from Earth. It is about seven times more massive than the Sun and siphoning gas from a nearby companion star. GRO J1655-40 undergoes short periods of intense X-ray emissions, followed by longer periods of comparative quiet. 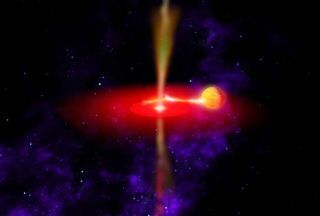 Scientists think this blinking pattern of X-ray activity is related to how matter accumulates around the black hole. Gas siphoned from the companion star builds up steadily in an accretion disk around the black hole. This process continues for several years. While the accumulation is taking place, the black hole consumes very little gas from the disk. Every few years, however, something--scientists aren't sure what--triggers a sudden binge fest on the part of the black hole, causing it to guzzle down most of matter in the disk within a period of only a few months. Black holes emit millions of times more X-rays during these periods of increased activity than when they're quiet. In recent years, NASA's Rossi X-ray Timing Explorer has caught GRO J1655-40 binging twice, once in 1996 and again in 2005. Among the X-ray frequencies observed in 1996 was one at 450 Hz and one at 300 Hz. These two frequencies were observed again in 2005. This was surprising because when it comes to X-ray emissions, black holes are not known for stability. X-rays are emitted from particles of superheated gas as they swirl into a black hole and rub against each other. However, the luminosity and the frequency at which the X-rays flicker varies from moment to moment because the rate at which the black hole consumes the gas is not constant. Therefore, detecting two stable frequencies nine years apart strongly suggests they are not caused by fluctuations in the black hole's gas consumption, but by something else. "Because it's very hard to get gas to behave the same way twice, it argues strongly that these frequencies are being anchored by the black hole's mass and spin, fundamental properties of the black hole itself," study co-author Jon Miller of the University of Michigan told SPACE.com. Because the black hole is so massive and spinning so fast, it warps spacetime around it. While devising his general theory of relativity, Einstein combined the three dimensions of space and the one dimension of time into a single useful concept he called spacetime. Spacetime can be thought of as an elastic sheet that bends under the weight of objects placed upon it. The more massive the object, the more spacetime bends. If the massive object is also spinning, it causes spacetime to not only bend but to twist as well. Scientists call this effect "frame dragging." Twisted spacetime will cause gas falling into a black hole to move in certain ways. The phenomenon can be roughly compared to the movement of a needle on a record player: as the needle moves along an etched groove on a record, it produces a sound, the exact nature of which is determined by physical deformations in the groove itself. Similarly, the black hole has created stable deformations in the fabric of spacetime that affects matter moving around it. Gas swirling around the black hole acts like the record needle, but instead of producing specific sounds, it produces certain frequencies of X-ray light. Scientists think that gas particles moving in warped spacetime near the black hole exhibit two types of motions, each giving rise to a unique frequency. One motion is the orbital motion of the gas as it goes around the black hole. This produces the 450 Hz frequency. The lower 300 Hz frequency is caused by the gas wobbling slightly due to the spacetime deformations. "If spacetime were not curved, we'd probably just see one peak," said study co-author Jeroen Homan from the Kavli Institute for Astrophysics and Space Research at MIT. Scientists think that all spinning black holes emit two stable frequencies, and that the frequencies are closely tied to the black hole's mass and spin. GRO J1655-40's mass had already been calculated based on observations of the companion star's orbit. The missing piece of information was the black hole's spin rate. The new frequency findings will help resolve this problem. "We can now begin to determine the spin and thus, for the first time, more completely describe the black hole," Miller said. The finding was announced earlier this month at a meeting of the American Astronomical Society.